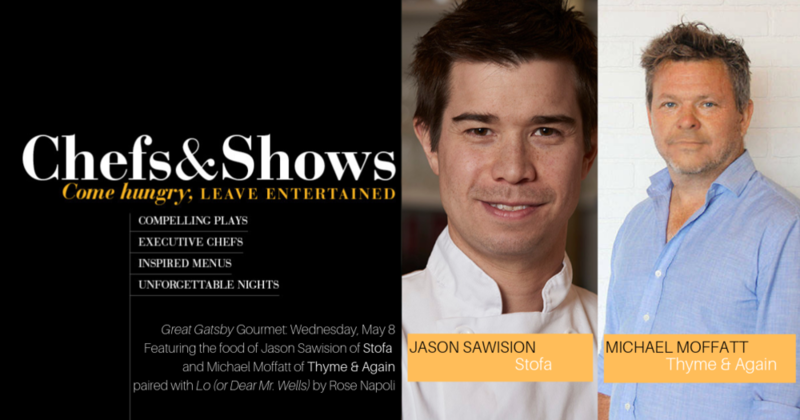 Chefs and Shows is back for the final show of our 2018-19 season, Lo (or Dear Mr. Wells). The theme of the event will be The Great Gatsby, a novel which plays a large role in the play. The night will feature the food of Jason Sawision of Stofa Restaurant and Michael Moffatt of Thyme & Again. The event will feature jazz music and a variety of decadent finger foods. Food will be served at food stations with seating for all guests. Tickets: Tickets are $100 and include dinner and the show. Gratuity is also included. *subscribers can upgrade their tickets for $70 via the box office. Prior to moving to Ottawa in 2011, Jason worked in the Toronto area at Canoe Restaurant and Bar (Anthony Walsh), Eigensinn Farm/Haisai Restaurant (Michael Stadtlander), and The Healthy Butcher. He received his chef training at George Brown College, and holds a Hotel and Food Administration degree from the University of Guelph. An Ottawa native, Michael Moffatt is a Managing Partner of Thyme & Again Creative Catering & Take Home Food. Formally Executive Chef and Partner of Beckta dining & wine, Play food & wine & Gezellig, Michael spent many years working in renowned kitchens including The River Café in New York and the Rimrock Resort in Banff. Michael has additionally won the prestigious Gold Medal Plates Ottawa competition twice, and has competed for the title of Canadian Culinary Champion. Michael makes a point of giving back to the community. He is a proud Algonquin College Culinary Arts Graduate and has chaired the Advisory Board for the Culinary program. Michael offers his services in support of such fundraisers as Algonquin College’s Exclusive TASTE & WALK Chef’s Dinner for Ottawa’s Maplesoft Cancer Centre and the CyberKnife fundraiser for the Ottawa Regional Cancer Centre at the Irish Ambassador’s residence. Michael has also offered in-home dinners to help raise funds for the Ottawa Regional Cancer Centre, the Maplesoft Cancer Centre, the Heart of Glass benefit for the Ottawa Heart Institute, the Jeanne Fuller Red Dress Golf Tournament for the Canadian Women's Heart Health Centre and in support of various Kids in Sports initiatives. Michael contributes to the Ottawa School Breakfast Program, the Boys and Girls Club of Ottawa and restaurant-based fundraisers for the Ottawa Food Bank.